Spike TV's VGA announcements are getting even more crowded, with a zombie teaser now discovered in a commercial. In addition to reveals of a BioWare game, Guillermo del Toro project, and a Sony PlayStation 3 exclusive, it looks like we now have a zombie announcement coming at the Spike TV Video Game Awards on December 11. In Spike's commercial that highlighted the BioWare tease is some hidden imagery hinting towards a zombie reveal. A frame was caught around 20 seconds into the commercial that certainly seems to point to one, anyway. 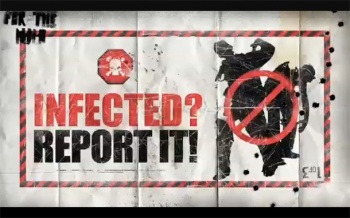 The image, which appears to be a poster that the government might post up during zombie outbreak, shows the silhouettes of two characters that look like they can shamble with the best of them covered by a red "No" symbol. The poster has the message: "Infected? Report it!" In the upper left corner the words "For the" are written followed by something unreadable. In the lower right we see an upside down "1 of 3." A QR code that flashes right before the image links to a Spike TV website that features the messages "Look Closer" and "Murder." What does it all mean? Judging by the image's bullet holes, it's possibly teasing a shooter, or at least a game that involves bullets. One of the most popular zombie shooters around is Left 4 Dead, so it could have something to do with the Valve franchise. There's always the possibility that this could be a brand new zombie game, but boy, the market's getting crowded lately. All I know is, all of these Spike TV teasers are really wearing me out. Will December 11 just get here already?